LiveCode LessonsLiveCode LessonsHow To - LiveCode Server Tasks Installing LiveCode ServerHow do I install LiveCode Server on Linux with Apache? This lesson will walk you through the steps required to install LiveCode Server on Linux with Apache. Apache is the most most popular web server package available today. Installing Apache will allow your machine to function as a web server, hosting websites and serving web pages. Most Linux distributions come with Apache installed by default. If not, you can either install it using the appropriate package manager for your system, download pre-built binaries for your system or build it from source. For more information on building Apache for your system, navigate to http://httpd.apache.org/docs/2.0/install.html. Begin by downloading the LiveCode server zip file for Linux using the instructions detailed in the lesson "How do I install LiveCode Server?". Unzip the package into your desired location - for example in your home folder. The location of your Apache configuration files will depend upon the setup of your system. Â They are often located located in either in /etc/apache2/ or /etc/httpd/. There is usually on main httpd.conf file in this folder that includes several sub configuration files. For example, on Debain based systems, the site configuration is often included in a sub folder /sites-enabled/. ScriptAlias /livecode-cgi/livecode-server "<path to LiveCode Server folder>/livecode-server"
You are now ready to test your installation. To do this, create a file named "test.lc" in your document root folder. Your document root folder is defined in your Apache configuration file and can be found using the interactions defined in the step "Set up LiveCode Server as a CGI engine". Prev: How do I install LiveCode Server on Windows with Apache? 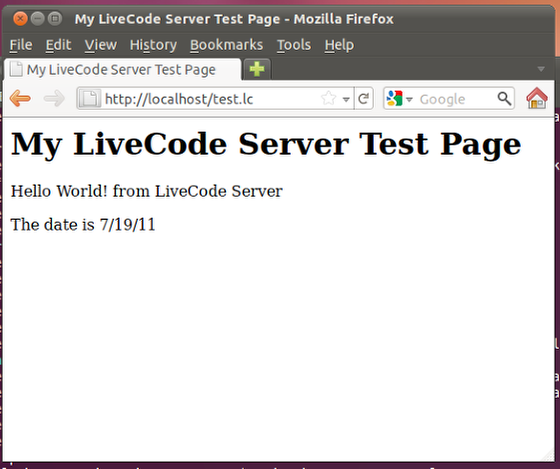 Next: How do I install LiveCode Server with Apache via .htaccess? I have set everything up as per instructions above but when I navigate to test.lc in a browser I see the hmtl script instead of the livecode expected output. I didn't get any release notes when I downloaded the server software so I cannot refer back to it. Does the result I'm getting have a known fix? I'm thinking the changes I've made to the directives in httpd.conf file are not correct. when you say you see the html script instead, what does that mean? Are you seeing the LiveCode script source, rather than the output you would have expected, had the LiveCode script been executed? Are you seeing text that is HTML formatted? Or are you seeing something else? from the information you have provided, it is hard to determine exactly what may not be working correctly. Our first assumption is that there is something wrong with your httpd.conf file. Have a look in there to see if all the configuration information appears to be set up properly. Sorry, reposting because everything I put in greater than, less than brackets became invisible. Maybe the mods can delete the previous version of my post? I just did this on Ubuntu Server 14.04. These directions do *NOT* work for this distro and its apache configuration files. You don’t wanna mess with the /etc/apache2/apache2.conf file at all. Just leave it alone. If you’ve unzipped the livecode-server (or livecode-community-server) in /usr/lib/cgi-bin then you only need to add 2 lines to 000-default.conf and to uncomment one line. Basically, the default configuration for apache2 in Ubuntu Server is all ready to go for cgi executables located in /usr/lib/cgi-bin. /etc/apache2/apache2.conf references a few other files that define a default virtual host in /var/www/html and so making the modifications to apache2.conf that this document recommends will get ignored or overridden by these other files. So, by placing the livecode-server file and externals in the expected place and then enabling cgi for the default host (and defining the handler and action), you’re good to go. Just place a test.lc file in /var/www/html and watch it run. I hope this saves someone the hours of frustration that I went through before I got it to work. @Russell Martin: Thank you, thank you , thank you.